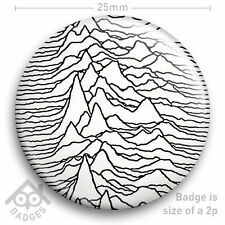 Joy Division Unknown Pleasures - Ian Curtis Factory Records Badge 25mm 1"
The label is waterproof; printed onto polypropylene with a mat laminate finish. Reproduction of classic Joy Division album record label. Strong adhesive backing, so can be stuck anywhere: wall decoration; guitar case, laptop, record box, on the side of a speaker etc. New listingJOY DIVISION PROMO POSTER. SIZE A3. JOY DIVISION PROMO POSTER. SIZE A3.. Condition is New. Dispatched with Royal Mail 1st Class. I will post WORLDWIDE. Part of a lot from Tower Records in the 90s. Please note that shipping outside of Europe is £8.85. JOY DIVISION PROMO CONCERT POSTER. SIZE A3. Joy Division. Repro record label sticker. Love Will Tear Us Apart. Factory. Reproduction of classic Joy Division record label. 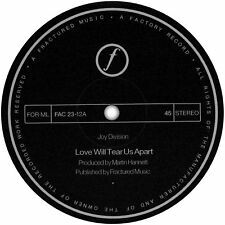 "Love Will Tear Us Apart" released in 1979 on Factory Records. Strong adhesive backing, so can be stuck anywhere: wall decoration; guitar case, laptop, record box, on the side of a speaker etc. JOY DIVISION CD x 10 BOX Set - The Singles 78-80 Plus Minus NEW ORDER. Condition is New. Dispatched with Royal Mail 1st Class. The catalogue has a crease down the back cover as seen in picture 3 but no other pages are affected. GREAT CONDITION ONLY THE REAR IS VERY SLIGHTLY DISCOLOURED. SIZE 24" X 17". EACH PICTURE CONTAINS 12 ALBUM COVERS THAT ARE 6cm by 6 cm each. Th January 1979. The condition is excellent. Good = Apparent wear and tear but with obvious deterioration of the condition. A plus or minus after the grading indicates that the condition is marginally higher or lower than the stated grade. An original concert ticket for The Mayflower Club, Gorto, Manchester on the 28. th July 1979, numbered 554. There is a vertical crease line and the previous owner has written on the reverse. The condition is very good minus. Nd March 2019 which has been signed by Peter on the front cover. The condition is mint. A plus or minus after the grading indicates that the condition is marginally higher or lower than the stated grade. Joy Division promo Poster "The Lowdown". Condition is New. Size A3. I will post worldwide. Listed to perform are Joy Division, The Human League and The Pretenders amongst others. There are several crease lines where the flyer has previously been folded. The condition is very good. Good = Apparent wear and tear but with obvious deterioration of the condition. By Clinton Heylin and Craig Wood and published by Sound Publishing. Joy Division photos by Kevin Cummins. All black cover with raised text on front. This is the second edition, printed late May 1980, and limited to 1,500 copies. An original flyer for the Joy Division performance at The Factory, Manchester on the 13. th July 1979. It was designed by Jon Savage. There are horizontal and vertical crease lines where the flyer has previously been folded. Th June 1978. The flyer was designed by Linder Sterling. There are several crease lines where the flyer has previously been folded. The condition is very good. Good = Apparent wear and tear but with obvious deterioration of the condition. ROB GRETTON. During his twenty-one years managing Joy Division and New Order, Rob Gretton. This book comprises the edited highlights of his collection. The material is presented in as pure a form as possible, without footnotes or annotation. IMAGE COLOUR IS BROWN & WHITE. GREAT CONDITION. H&M HENNES DIVIDED JOY DIVISION UNKNOWN PLEASURES LIGHT GREY POCKETED HOODY SIZE M Condition is like new as worn only once. VERY GOOD & EXCELLENT CONDITION. Ideal collectors’ item of CD replicas of 10 singles presented in a beautiful clamshell box. “Atmosphere”. JOY DIVISION. The Singles 1978-80. 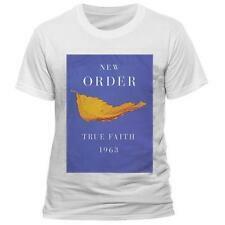 - has 21 songs over 10 discs in a box designed by Factory Records co-founder Peter Saville. SALE.IAN CURTIS. HAND PAINTED ONTO 22 X 16 INS. JOY DIVISION. STRETCHED CANVAS. USING ACRYLIC PAINT, BRUSHES, PALLETTE KNIFE. RARE ORIGINAL 1986 CALENDAR FOR JOY DIVISION AND NEW. ARTIST: JOY DIVISION / NEW ORDER. TITLE: CALENDAR. YEAR: 1986. EXCELENT CONDITION. JOY DIVISION. the majority have the date written at the edge of the cutting or on the reverse. all carefully CUT OUT from Magazines such as Record Collector etc.mainly from the 00s & 10s. This is a FIRST printing. NEW ORDER Santa Monica Civic 1985 CONCERT FLYER Punk JOY DIVISON Minty! Original rare 4.5" x 8.5" concert flyer for the Santa Monica Civic Auditorium in Los Angeles on August 22, 1985. Near mint condition! 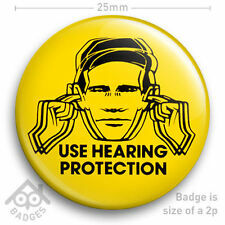 A set of 36 quality 25mm badges featuring Joy Division 1978-1980 era. 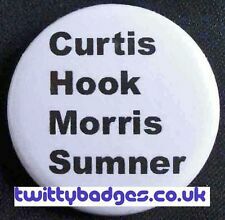 Badges are NEW and mint condition. Quality Components - British Manufacturers have been used in the production of Outlaw's button badges for 12 years. 24 Hour Party People Two Film Movie Posters Coogan New Order Joy Division Huge! Note the one with Steve Coogan on the front is quick big! Show slight wear from storage on edges, but still look amazing. GLOSSY, UK, 1980's. SIZE: 25" x 35 ". SUPER RARE! THE RAREST OF RARE. 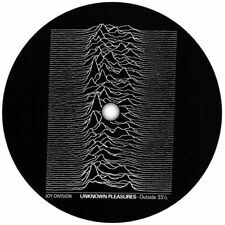 Title : "Joy Division, Unknown Pleasures". Limited edition art print of 295 signed by the artist who created the art print and not the band/artist featured in the design. Joy Division promotional Keychain container with earplugs! Rare! THE SISTERS OF MERCY "IN CONCERT ROYAL ALBERT HALL" SUBWAY POSTER 40 1/2" x 61"
JOY DIVISION ~ LOVE WILL TEAR US APART 23x33 MUSIC POSTER NEW/ROLLED!